For any actor or actress, taking on a role that suits one’s strengths can make or break even the most well-intentioned performance. It’s much the same in music and, in the case of Scarlett Johansson—who last year debuted with an album of Tom Waits covers (save for one original)—her approach didn’t suit the script, so to speak. The result, Anywhere I Lay My Head, was a techno-laden disappointment underscored by vocals that sounded awkward and bizarrely removed. Enter Pete Yorn, who on Break Up has written eight original duets (save for one cover)—conceived in the spirit of Serge Gainsbourg’s 1960s star-crossed recordings with Brigitte Bardot—creating an ideal vehicle for Johansson to blossom as a vocalist. Amid a swirl of ambrosial melodies and playful (often cartoonish) effects, she sounds refreshingly natural and fetching. It’s the chemistry between the two, however, that ultimately redeems the songs. Yorn and Johansson hem and haw through the fuzz-toned flurry of “Relator,” laying their relationship on the line at the outset—“You can leave whenever you want out,” they sing—setting the tone for its imminent demise. They strike similar resonance with the ominously titled “Blackie’s Dead,” their back-and-forth vocals benefiting from a swift, catchy beat. Like any other love on the rocks, though, the couple that comprises this one is riddled with insecurity and should-I-stay-or-should-I-go doubt. “I’m so confused by you,” each concedes in “I Don’t Know What To Do,” before reminiscing through rose-colored glasses, “But when you’re with me, darling/I don’t believe in anyone else.” Inevitably, such warm-and-fuzzy feelings don’t linger too long (three minutes, thirty-one seconds to be exact); otherwise the album would’ve been called Make Up. And so as they drift further away from each other, the music in turn grows more spatial and aloof, but never dull. Even in the woozy haze that looms through cuts like “Clean” and an abstract cover of Chris Bell’s “I Am The Cosmos,” Yorn and Johansson still summon an occasional glimmer of levity. 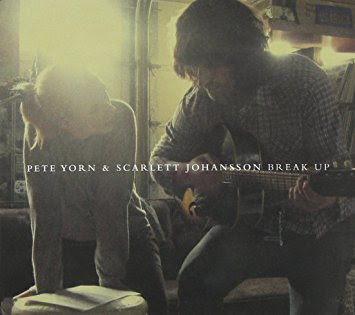 Break Up is a charming album all around, one which not only demonstrates the evolution of Pete Yorn’s talent but, for Scarlett Johansson in the realm of music, the promise of hers as well.